Giliane & I live in one of the hottest spots in the USA, the Arizona desert. Why in blazes would you guys move there, you ask? Well, we have lots of family in the area, and we were anxious to own our own home instead of renting. Where we previously lived it was damn-near impossible due to the cost-of-living being outrageously high. That, and it's just flat-out gorgeous in the wintertime when everyone else has snow on the ground. We have been happily married now since 1999, which means that we're going on 13 years now. Not only that, as of October of this year, we will have been together for 15 years. And you know what? I wouldn't have it any other way! If you see that "Wii" picture up there and wonder just what it is, that would be Nintendo's video game console, called the Wii (pronounced "we"). It's a very interactive console that actually has you moving the controller around like you would if you were actually in the game. For instance, they have a bowling game that we really like. You actually have to go through the motions of throwing a bowling ball in order to actually throw the ball in the game. It's the cheapest new system out there when compared to Xbox 360 and Sony's PSP3. And the best, if you ask me! The favorite TV show that we like to watch together is on Fox, called "Bones". Great show about a forensic anthropologist and her FBI liaison. We (well, mostly me) also enjoy watching a show on the Discovery channel called "Mythbusters". That's one of my favorite shows. This group of people set out to either prove or disprove urban myths. If you're able, check out an episode or two, give it a try. You might find yourself hooked! 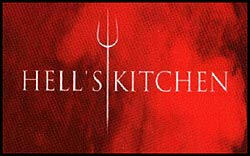 With serious regret, I find myself drawn to a reality-based show that Giliane enjoys watching, called "Hell's Kitchen". I personally hate anything that's reality-based like that, but I can't help but laugh when that chef just rants and raves at his underlings, and then kicks one of them off the show at the end of the episode. The remaining person, at the end of the season, gets control of their very own restaurant. We also enjoy spending time messing with our pets. :) We have one cat and one little dog. The kitty is Argo (tabby) and Keeley (Welsh Corgi Pembroke). Our cat is starting to get up there in years, but you'd never know from the way he acts. He still plays like a little kitten at times. However, he isn't as nimble or agile as he once was. I've seen him try to jump to the window sill and end up slipping off the couch, or not quite make it up to the window sill. I'd feel bad if it wasn't for the pissed-off look on the cat's face when he didn't make it and then would go stalking off into another part of the house. Our dog is a purebred Welsh Corgi Pembroke, Keeley, who was born in July of 2007. So she's still a puppy. She loves to play with other dogs, chase the cat (much to our annoyance & his), pull out all her toys from the basket and scatter them everywhere. Feel free to check out the other pages of the site if you'd like to see some pics!